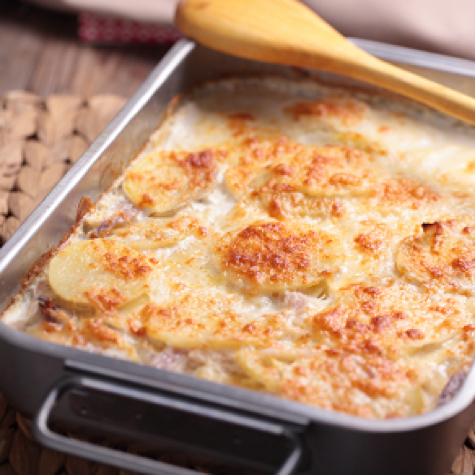 Colman’s have teamed up with popular food blogger and YouTube chef Ian Haste to give you this delicious Cheesy Dauphinoise Potatoes recipe, perfect for an extra special Roast Dinner this Summer. Create the Colman’s Cheddar Cheese Sauce Mix by adding milk and heat in a pan. In a separate bowl add crème fraiche, crushed garlic, the Colman’s Cheddar Cheese Sauce mix and salt and pepper if desired. Peel and thinly slice or mandolin the potatoes through the mixture. Layer the potatoes in a feather style in a greased ovenproof dish, pouring over a little of the sauce between each layer until you are ¾’s full, finishing with the remaining sauce. Grate the cheese evenly over the top and bake for 35 minutes at 200°C, 180°C fan, Gas mark 6 until golden brown.